Certain places just attract people. The cool, clear water of Little Buffalo Creek has been attracting people for centuries. American Indians frequented Little Buffalo Creek on hunting trips. Farmers and merchants used to gossip and pass news while the grain was ground at Shoaff’s Mill. Nearby, merchants, local people, and travelers met at Blue Ball Tavern. 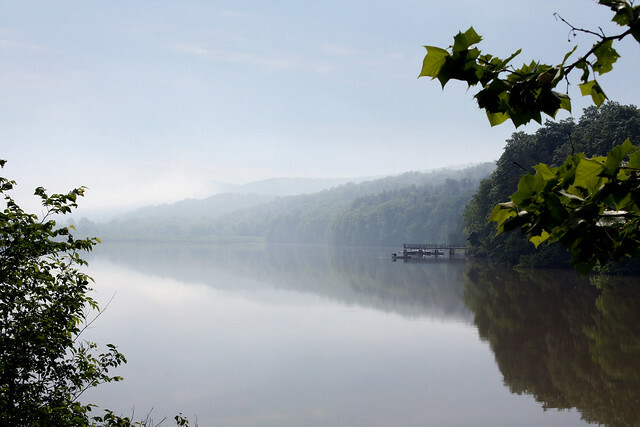 Today, thousands of people meet at Little Buffalo State Park to picnic, swim, fish, hike, and experience nature and history. From PA 322, take the Newport Exit and follow PA 34 south through the town of Newport. One mile from town, turn right onto Little Buffalo Road to the park. From PA 322 to the park entrance is 4.6 miles. Located in the campground, the rentable Recreation Hall seats 200 people for wedding receptions, family gatherings, and meetings. Contact the park office for reservations and additional information. Old Fashioned Apple Festival: Held the third weekend of October in time for fall foliage, this festival will take your taste buds back to the mid-19th century. You can see and taste apple butter cooked in a large copper kettle in front of Shoaff’s Mill. Apples are ground and squeezed in a century-old water powered press. Shoaff’s Mill grinds cornmeal, cracked corn, and apples. Visitors may taste samples of apple cider, apple butter, and cornmeal recipes as long as supplies last. Christmas Walk: This family-oriented activity has become a popular holiday event in the county. Thousands of lights and holiday cutouts dot East Picnic Area and provide the perfect holiday atmosphere. Santa always makes an appearance. Local 4-H Clubs sell cookies and hot chocolate. Area choirs sing carols many of the nights. The program runs December 17 through December 23, from 6:00 P.M. to 9:00 P.M.
Little Buffalo State Park offers a wide variety of environmental education and interpretive programs. Through hands-on activities, guided walks, and campfire programs, participants gain appreciation, understanding, and develop a sense of stewardship toward natural and cultural resources. Programs are offered year round. Many programs feature Shoaff’s Mill. More than 12,000 people visit the mill annually. Contact the park office for more detailed information on programs. This activity or structure is ADA accessible. An ADA accessible fishing pier is at the main boat launch. There is a paved trail from the swimming pool to the boat rental. Blue Ball Trail is paved and ADA accessible in East Picnic Area.